The Pension Protection Fund produces a monthly index update (this month’s release has data taken as at end-June 2013) of the estimated funding position of the defined benefit schemes which would be potentially eligible for entry into the Fund. 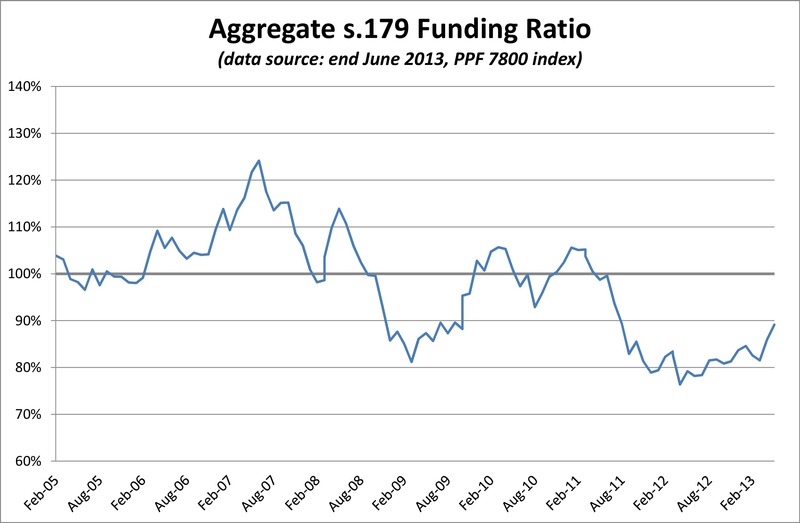 June’s turbulence saw a significant net improvement in universe funding levels. The mid-month turmoil in growth asset markets had at least in part moderated by month end and gilt yields heavily increased over the month – for instance 10yr gilt yields rose by about 45bp in June – resulting in a heavy drop in the assessed current value of liabilities which more than offset volatility in assets. 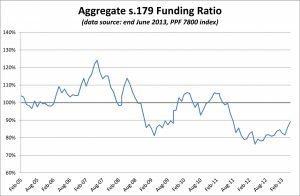 As a consequence, there was fall in total scheme deficit from £185.5bn in May to £134.3 in June with a corresponding improvement in s179 funding ratio to 89.1% from 85.9%.